You think sometime why i am not so confident in front of people? In a room you are so so confident. Here i am giving you a solution to boost your confidence. Yoga, Yes yoga can boost your confidence. We are experienced about this, You should try this at once. And now question is How? How can Yoga boost my confidence? You might be presently asking this question yourself. Well there’s nothing Yoga cannot do & boosting self-confidence is no exception. Yoga includes numerous tools to help raise a person’s vibrations from the lower energies of self-doubt to the enlightening energies of self-faith and confidence. 1. The Tree Pose (Tadasana): You can never go wrong if you trust this one to remove the doubts. To do this, stand straight , inhale till a count of six and then exhale for a count of ten. Follow up with two repetitions of this deep Inhale and deeper exhale this way. Then, gently raise both arms over the head, and rise on the toes. The palms should face forward. Balancing the body weight, stretch all back muscles as gently as possible. Kindly do not exert. Inhaling & exhaling deeply, continue this pose for two more breathes. Finish by gradually easing back on the feet. 2. The Warrior Pose III (Virbhadrasana III): This advanced Yoga pose strengthens the back, shoulders, Legs and Ankle. It improves posture and agility. Start by putting your hands on the hips. Bring the left knee into the chest and extend the left leg to the behind, parallel to the mat. Press into the right foot while controlling the left toe towards the floor to square the hips. Extend the arms down to the length of both sides. Lift up through the muscles in front of the right thigh and squeeze into your abdominal muscles. Feel the strength within. When the Asana starts seeming challenging, bring the focus back to the breath. Without exerting out, hold on to the pose as long as comfortably possible. 3. The Eagle Pose (Garudasana): Firmly dig in all four corners of the right foot and bring the left knee up into the chest. Bend the right knee and wrap the left knee over the right. Both legs will subsequently cross at the shins. Make a T-shape with your arms and wrap the left elbow underneath the right. If that seems too much, let opposite hands hold opposite shoulders. This pose strengthens the legs & calves and stretches the shoulders, upper back and hips. It improves balance and helps relieve sciatica & rheumatism. 4. The Chair Pose (Utkatasana): Utkatasana brings in a sense of ease & balance in the body. It helps alleviate the lack of self-esteem. 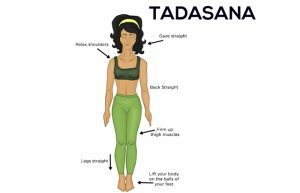 In Mountain pose with the feet together or hips a width apart, inhale the arms forward parallel to the floor with the palms facing down. While exhaling bend the knees, squatting down. Reach the hips down and back as going to sit on the edge of a chair, bringing the body weight to the heels of the feet. Do not bring the hips lower than the level of the knees. Ensure that the knees are pointing straight ahead. Press the shoulders down and back and attempt to arch the spine. Relaxing the shoulders down and back, reach out through the finger tips. Stare at a point on the wall or floor ahead of you to balance. Breathe and hold for 3-6 breaths.